LANDOVER, Md. – The first two Raiders games went according to plan. They established an early lead, played solid defense and cruised to victory. The offense proved a dynamic and defenders exceeded expectation. That streak snapped on Sunday night, when nothing went right. The Raiders fell off the rails early and never recovered, losing a 27-10 decision to Washington at FedEx Field. They made an average Washington squad look like a juggernaut. A prolific Raiders offense wilted under Washington pressure. Their mighty offensive line had its worst day in a while and typically reliable quarterback Derek Carr was off target. The Silver and Black had just 128 yards of total offense, and gave up explosive plays on defense. They were beat soundly on both lines, and were never able to dig out of a early rut. The Raiders were uninspired in most instances, but Marquette King gave his team some life. He forced a muffed punt late in the third quarter that James Cower recovered. Carr found Jared Cook on a 21-yard touchdown that ended the shutout. 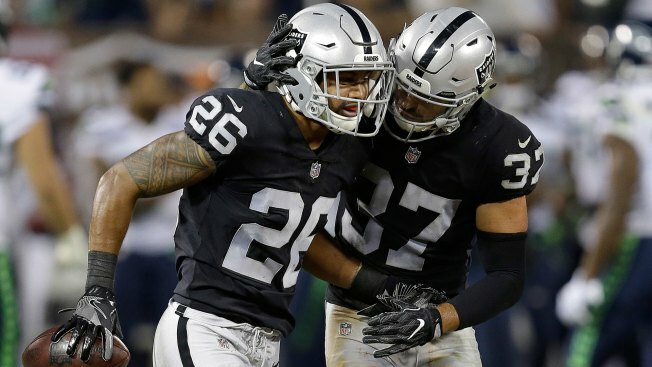 The defense didn't allow a comeback to take shape, giving up a 74-yard reception to running back Chris Thompson – he had 188 yards of total offense – that set up a field goal that put the Raiders down three scores. The Raiders laid an egg in the first half. They got manhandled on both sides of the ball, committed silly turnovers and gave Washington quarterback Kirk Cousins far too much time to work. He picked the Raiders secondary apart on two touchdown drives that established a two-score halftime lead. Former 49ers tight end Vernon Davis, seeing more time with Jordan Reed hurt, had five catches for 58 yards and a touchdown. The Raiders have long struggled covering tight ends, and made the veteran look like his old self, when he was dominant as a 49er. The whole team seemed flat early in this game. Marshawn Lynch struggled to get the ground game going, Carr threw too many to the other team and the Raiders fell in an early hole. Carr's rough start: Derek Carr's first pass was an interception. It wasn't the only one. The typically reliable Raiders quarterback was out of sync to start this nationally televised contest, and the offense sputtered as a result. He was sacked on consecutive plays, as the offensive line struggled to maintain a pocket. Washington scored after both Carr interceptions, and he finished the first half with just 32 passing yards. Marquette strikes again: Raiders punter Marquette King puts some English on his punts. They're tough to catch when he does that. He forced a muffed punt for the second time in as many games, Sunday night, which helped the Raiders get on the scoreboard. James Cower recovered the muffed punt, and Carr found Jared Cook a few plays later to score the team's first touchdown.